That’s me pulling out a mint plant from our garden, as part of The Great Renovation. Check out those amazing roots! 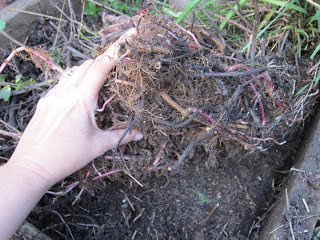 This container was filled with a 5 inch thick mat of thick, tangled roots. No wonder mint is unstoppable. I adore mint, but we had two big mint plants, and under the new scheme, I’m trying to be more efficient about the way space is used in the yard. So this guy had to go. I thought I’d be digging roots out of the bed all day, but turns out they formed this thick, impressive mat you see above. I’m sure small bits will remain to haunt me, but all in all, I’m grateful it was that easy. If you’re thinking about planting mint for the first time, keep in mind that it spreads, given space and water. Its roots, properly called rhizomes, run underground and can send up shoots many feet away from the mother plant. In this way, it will cheerfully take over your entire herb bed or your borders, or wherever you thought fit to plant that innocent looking little seedling. If you try to pull it, little bits of leftover rhizome still in the ground can form another plant. For this reason it’s better to plant it in a container, or in a bottomless container sunk into the ground. You need to corral those roots, basically. Otherwise, it’s an easy, abundant plant to grow. 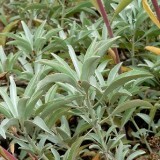 It likes water and sun, but does tend to wilt or even go brown in hot, intense, summer sun. So I’d either plant it where it gets partial summer shade, or move its pot somewhere shady during the heat. And don’t be afraid clip it back when it starts to look rangy. It will pop right back up, looking much better for its haircut. Why should you grow mint? Here’s some of my reasons: Fresh mint tea (fresh mint tea is pretty and has a delicate flavor); dried mint tea (always on hand for overfull belly syndrome); fresh mint chopped up over fresh fava beans and goat cheese; fresh mint mixed with basil in a nut pesto; fresh mint sprinkled over yogurt drinks, mint infused honey for colds; dried mint in the bath; mint simple syrup; mojitos; and I’m sure there are more…and the tiny native bees like it a lot. Should you plant spearmint or peppermint? Both are good. Peppermint is stronger, but I consider them interchangeable. (If you’re trying to figure out which you’ve got in your yard, spearmint has matte, bumpy leaves that are bright green where the growth is new, whereas peppermint’s leaves are smoother and somewhat shiny and darker green, sometimes with purple tints.) For tea, I like the flavor of fresh spearmint best. Purely a subjective opinion. So the plant I’m pulling out in the picture was our peppermint plant. Spearminticus Victor! I lovingly plant mint where other things will not grow. It’s great for filling in the partly shady spots where nothing else takes hold. I dry the leaves for mint tea in the winter and my daughter eats fresh leaves as if they were salad greens. I love mint! I only grew mine in containers because of everyone warned me how invasive they were. 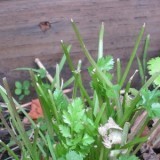 It’s such a versatile herb, can be in sweet or savory dishes. I used to receive a regular sentence every summer as a kid that involved being regularly dropped off every day at my grandmother’s and left to weed the mint and canna lilies (another rhizomous monster) out of her yard. It never worked as a deterrent punishment, because invariably I’d forget by the beginning of the next summer and do something to warrant the sentence again. 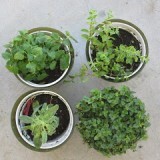 Consequently, I have my Moroccan mint in a planter on the deck. It goes in Tatziki and Taratoor sauces, and into a Mediterranean salad with oregano. I almost think I prefer mint in savory dishes, than sweet. It is not enough to contain mint in a pot. If it flowers & goes to seed, it can still spread. I wish we’d know that a couple of years ago. Ooh. Good to know about that flowering and seeding thing, which I hadn’t considered, and which makes perfect sense! Wow that’s a cracker of a root system!! I was given a small spearmint ( thanks for your identification!!) and thankfully I planted it in an old wheelbarrow, it looks lovely and won’t give me a headache later!! @Anon: Thanks for the tip about the seeding. We let ours flower, but have never had a problem. That’s most likely because our yard is so dry. Those of you in more mint-friendly places might want to trim your mint before it goes to seed. Oh man, I’ve been taking advantage of mint’s ability to devour space where I live right now. I live in an apartment building with lawns full of clover (like), and crab grass (do not like). When the mint spread from its pot near the back porch, I started encouraging it. When it’s a choice of three different invasives, well… At least the clover and mint support the bees. And my mum and grandma like to make tea with the mint. Though if we end up moving somewhere with more control over our backyard eventually, I’ll be more vicious in my corralling of any mint plants we bring along. I’m thinking of planting it in a dirt-filled kiddie pool so we can have a nice large bed of it, but still be able to keep the roots contained. hello can mint roods lift up pavement? I don’t know! I don’t think so. I have different kinds of mint growing all over the cottage property, which is about 3/4 of an acre. Spearmint, peppermint, pennyroyal, and most recently, mojito mint, which smells lovely. It is great ground cover for tatty areas and fills in the ditches quite nicely. 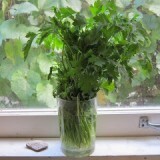 Traditionally I have made mint sauce, but I will try the fresh mint tea suggested here, and the mint syrup. If I allow my chocolate,peppermint,orange and spearmint plants to become root bound would I beable to cut off the roots at the bottom of the pot to grow more of the same plant it was taken from.? Also which mints will survive winter in zone 4 in Ontario? 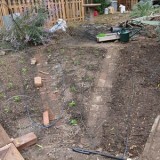 I’m no big mint expert–merely someone who tries to keep her mint corralled in the back yard. It’s really easy to propagate mint from cuttings of the green parts–just cut sprigs and put them in water until roots form, then plant. Mints do sprout up from roots running underground, but I don’t think that roots which have been cut from the mother plant will regenerate. The roots of some plants do, I know, but you’d have to google around to see if that would work for mint. Also, being from LA, I have no experience with cold weather varieties–sorry!